Wood Destruction by a Woodscrub: My First Handtool Project! Card Scrapers - Why you want to use 'em! 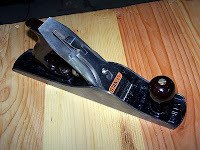 I'd been playing around with my Stanley Bailey #5 plane but never really did anything with it. Power tools are so convenient there was no real "need" to use anything else. 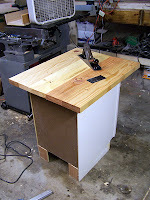 Last weekend I decided I needed a small assembly/finishing table made from a spare kitchen cabinet I had. I used scrap 2" thick pine from other projects to make the top. I used the jointer on the edges, glued 'em up, then looked at it closely. The wood was all different thicknesses (from different sources), and needed flattening. I initially reached for my belt sander then realized this was an ideal time to try hand tools on a real project. I sharpened the blade on my #5 and went to town. The process was actually really fast, only taking an hour or so to level the top. Which was good because my shoulders couldn't have taken much more, heh. The pile of curly shavings around my feet was substantial! But nothing was in the air as with a sander, and I was able to work when the family was asleep upstairs. The first few minutes was spent tweaking the blade to get a smooth cut without leaving gouges in the wood. Easily done, and no other issues except those ugly knots you see in the photos. They were brutal when planing into them. I had to move *very* slowly when I got to them which killed the groove I was in each time I got to one. But even the knots succumbed eventually! I cleaned up the tool marks (mostly) with a card scraper. That tool I use frequently, so it only took a couple minutes to get the surface smooth to the touch. I love working with the plane, and will be looking for more planes so I can do more without power tools.